These are compatible with torches using the Trafimet S30/45/54 consumables including the ergocut and autocut S30, S35K, S45, and S54 torches as used on many plasma cutters. The electrodes are turned copper, with hafnium cores. 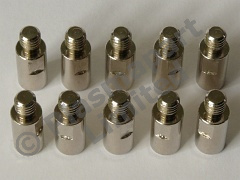 This pack is supplied as shown, and contains 10 gouging electrodes.